I have heard it said in quilting (as well as other art mediums) that copying is just a form of flattery. Well then I am guilty of flattery for women of a bygone era. 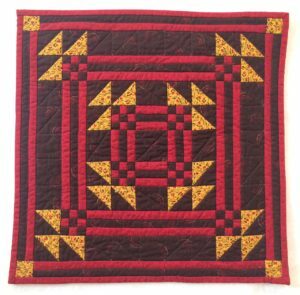 The three quilts I am sharing with you this week are reproductions of antique quilts. This first one is my favorite. I found it on line being sold by a quilt dealer and I fell in love with it…until I saw the price. I know it was worth it, but I didn’t want to pay so much. Instead I found reproductions that were similar in color and pattern and made this myself and even hand quilted it. I call it the $950 quilt! It is 16” x 16”. 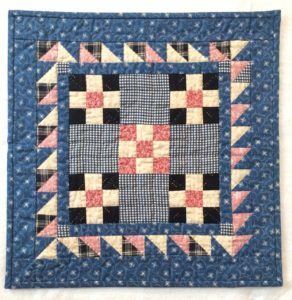 This next one is reproduced from a quilt in Childhood Treasures book by Merikay Waldvogel. My challenge was to bring the fabric from the back to the front instead of adding a binding. I had never done this before and I hope to not do it again. I learned that I like making traditional binding a lot more than bringing the back fabric to the front. The last one is also 16” x 16”. 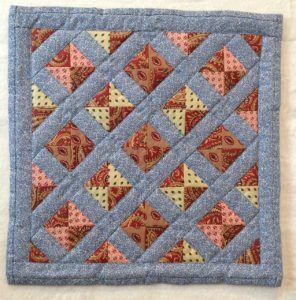 It is copied from a Kate Adams quilt I saw on line (of course hers are less than half this size) but I love the 9-patch interacting with the half square triangles. I think this would also make a beautiful quilt if it were done in full size for the bed. You just never know from where your inspiration might come for your next quilt project. ← It’s Our 6th Anniversary!! !